Don't see your card reader? 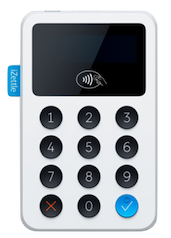 Click here for an overview of all iZettle card machines. How do I start using the iZettle Reader? Please see our quick start guide. Why is my Reader not charging? Go to the iZettle Go app menu by tapping . Then go to Settings > Card readers. A “Charging” indicator will appear next to Battery level when your iZettle Reader is charging. If you’re using a Dock to charge your Reader, the LED light should light up as green. The charging plates on your Reader or the Dock are dirty. Dirt can accumulate over time and prevent a charge. Gently clean the 2 small golden circles behind the Reader or on the Dock with a soft brush or cloth and alcohol. Do not use anything metallic to avoid damaging the plates. The USB port, outlet or cable is faulty. If you haven't done so, try a different port. Alternatively, try a different USB cable. The Reader isn’t aligned properly with the charging plates on the Dock. Check the alignment and try reconnecting your Reader to the Dock. The Reader is malfunctioning. Try restarting the Reader by holding the power button. If you’ve tried all the above and your iZettle Reader is still not charging, contact our Support Team for further assistance. Why won't my Reader start? Make sure that your credit card machine is charged. Connect it to power either via USB or the Dock. Hold the power button for a few seconds to reset your Reader. You may need to hold it for more than 20 seconds. At this point, your Reader should start. If your Reader is still not starting, please contact our Support team for further assistance. My Reader keeps showing “Looking for” or ”Waiting for” when I’m trying to pair it to my smartphone or tablet. If your Reader shows “Looking for” (on iOS) or “Waiting for” (on Android), this means that your Reader has been previously paired either with the same device or a difference device. If your Reader is not detected by your smartphone/tablet, first make sure that Bluetooth is turned on on your device. If it has not been previously paired and you just turned the Reader on, restart pairing by holding the OK button for 3-5 seconds and then completing the standard pairing steps. If your Reader still shows “Looking for”/”Waiting for”, go to Bluetooth settings on your smartphone or tablet. Then check if the iZettle Reader appears on the list and is shown as Connected. If there are any other Readers that appear to be paired as well, remove those devices that you do not need by tapping on “i” and then on “Forget Device”. Only the Reader you would like to connect should remain on the list. Restart the pairing steps again. When the Reader shows “Connected to”, the pairing should work normally. ​Simply restart the reader by holding down the power button on top of the reader for up to 3 seconds. When the reader is turned off, start it again. If your issue is not resolved, please contact our support team for help. This issue is mostly Android related and happens when the Reader is ready to take cards but the iZettle Go app is not. Firstly, only insert or swipe the card when the “Insert/Swipe card” message is shown in your Reader. If your customer’s card still can’t be read, go into Settings > Card readers in the iZettle Go app and check if the Reader is connected. If the Reader is connected and the “Insert/Swipe card” screen is shown, it means there’s a good connection between the Reader and your smartphone/tablet and your Reader should be able to read cards. If the problem persists, please get in touch with our Support Team for further assistance. How do I know if there is a software update? If you want to check what version of the reader software you have, or if you just want to know if there is an update available you can always go to “Settings” > “Card readers” and then select your card reader by tapping it. How do I know what software my reader has? You can check which version of the reader software you have by going to “Settings” > “Card readers” and then selecting your card reader. It will be shown on the list. Do I need to take any special care with my Reader? Treat your reader gently! The iZettle card reader has an internal protection mechanism which is very sensitive. Any strong impact or drop from a significant height can cause a “Reader Damaged” message. My reader shows the message “Reader Damaged”. What can I do? “Reader Damaged” means that something has triggered the internal alarm system. Please contact customer support for further advice. If the suggestions above didn't’ help with your issue, please get in touch with our Support Team and we’ll help you.